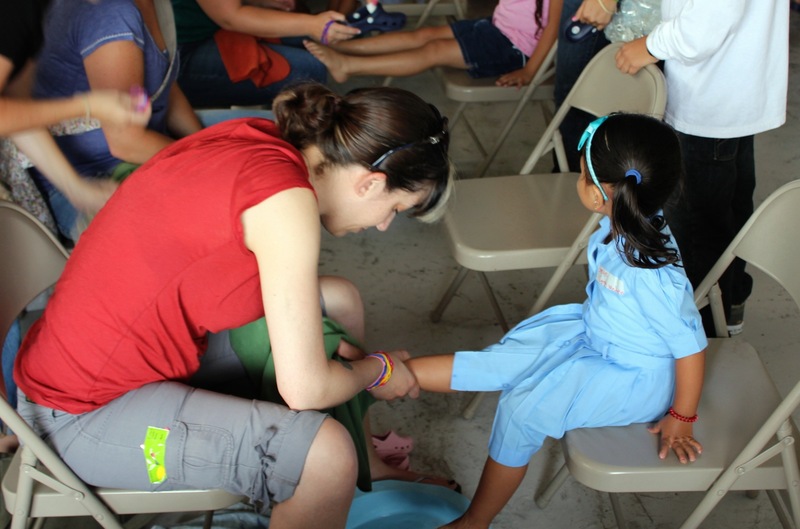 It is very difficult to speak about what we experienced as volunteers last July with Travel4Souls in Costa Rica. The most poignant photos that you managed to capture fail as visual aids. You unsuccessfully try to choke back tears as you speak of your time in the slums. The emotional conflict of not being able to relay the urgency of humankind’s need for a loving hand is simply overwhelming. Fortunately, the first group to head to Costa Rica a few weeks ahead of ours had fellow volunteer/news anchor on their trip, Christine Maddela. Below is a great clip showcasing friends Kelly and Jenny; (see more on the Travel4Souls YouTube Channel). Watch Guthrie’s story to catch a glimpse of the rainforest that yours truly ziplined through. Yes. Me. They had to break out the pliers to loosen my helmet to fit my big head. Go ahead. Laugh. 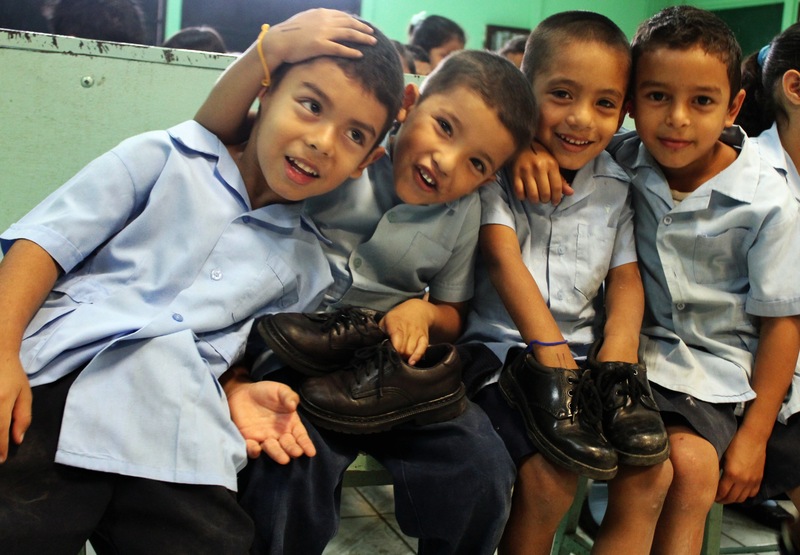 This page allows you to follow the Travel4Souls team across the world as they distribute shoes in the U.S. and around the world. Recent trips include India, Africa, Costa Rica and Haiti. Read Katie Lentile’s blog here: http://www.thesoulexperience.com. To find out how to go on a trip yourself, go tohttp://www.travel4souls.org. Still Waiting, a photo by jdespres15 on Flickr. I am slowly editing all of my photos from La Carpio while trying to ease back in to my routine. When the Travel4Souls crew first walked through the unpaved streets of the “Village of Hope” we were warned not to take out any expensive looking cameras. Prepared for this, I had brought a couple of disposables. I only shot about half way through one of the cardboard cheapies before I stopped and realized that I had been had! I have always been weary of the sensationalization caused by the general media and was and am still very protective of my notorious hometown, New Bedford, MA. Why was I afraid of walking around La Carpio with a Canon? My advice when traveling with expensive photographic equipment that you are aching to use in such situations? 1. Use the same sense in any slum that you would in New York, Lima, or Paris. Try to stay in a group. Don’t walk around alone at night, and keep your belongings close. 3. Don’t be a walking billboard. I bought a map case from the Army/Navy store for a mere $14. I had already removed my Canon strap for a more comfy and (of course) fashionable subtle camera strap that I had found in the Photojojo! store last year. Keep the strap tight around your wrists and the satchel swung to the front of your body. 4. Keep it simple. One lens will do. If you are a great street photographer, you should know that the best shots are unexpected, somewhat unfocused, and very candid. There is no need for a telephoto lens unless you want to peer in to people’s homes, and if you plan on doing so please re-read #2. The best photos in my particular scenario were results of engagement with the subjects. Read some great tips from Chris Osburn, fellow blogger. While the truths of La Carpio peek out in many of the shots, they are just that — truths! And the fact that I could capture such beautiful smiles, saturated and lively art murals, and true heart in these photos is simply a testament to the unparalleled spirits of the people of La Carpio. Here a family waves, smiling from their porch. This is one of the few that I could salvage from the disposable camera, inherently dreary and grainy. I find it beautiful, nonetheless. It’s just simply not an accurate depiction of La Carpio. La Carpio. Taken with a $3 disposable, Family sits on porch and waves. SEO. SSO. Tagging. Sharing. Liking. Bragging. Pre-ordering the pre-order. Flaunting exclusive invitations. App updates. Touch screen. Voice activate. Faster. Smaller. Slimmer. Gotta have it first. Better than last month’s version. Well you have come to the right place, because here is some footage you will not see any where else. Rare, raw, emotional, and real, the story of how La Carpio. Please take the time to watch and hear these stories, and share if you please. 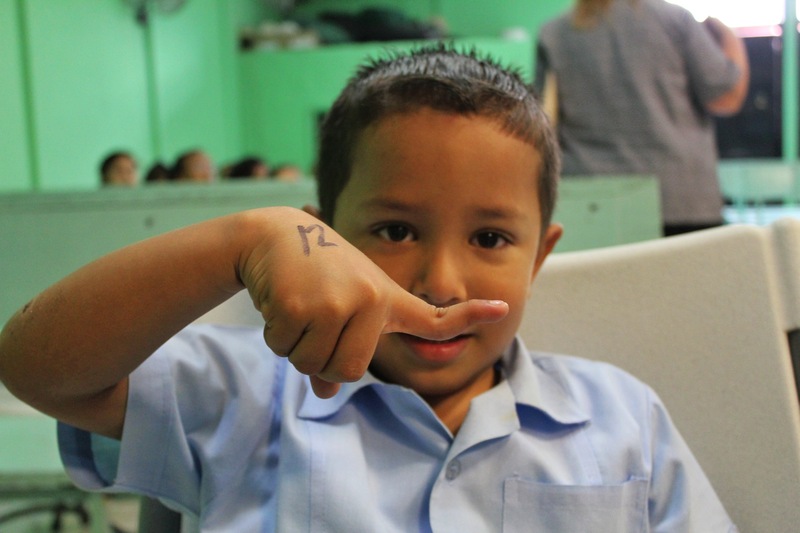 Village of Hope: La Carpio from Dana Freedman on Vimeo. Kindergarten Boys in La Carpio pose for a quick photo before heading back to class. My mind is flooded with thoughts. Completely inspired by this trip, we all thirst to do more. We handle it in different ways. It’s been a few days and I still find myself bursting out in to tears at inopportune moments. At a busy toy store in Miami, I began to have a full-blown panic attack seeing all of the children pulling and pushing at their parents. Crying and wailing, they begged for plastic barrettes, Hello Kitty wallets, and the like. I kneeled down to inspect a set of hairpins that caught my eye. My curiosity quickly turned to introspection. My thoughts flew at warp speed. Visions of the little girls in La Carpio mobbing me as I ran out the locked gate to the school quickly flashed before my eyes. They weren’t mobbing me for the box of stickers and toys I was handing out. They weren’t squealing at me in Spanish with tears in their eyes. They were smiling and lining up to simply give me a hug and a kiss. “Te Amo!!! !”, each of them belted at me before they stepped aside to let the next little one have their chance. Once I realized that all they wanted was a chance to show love and gratitude, I hugged one little girl longer. I will never forget what she looked like despite the throngs of children we met and she will never know how much she changed me. It was on that last day in La Carpio when I realized something. I did not see these children nor any of the citizens of La Carpio as poor. When I use that word, I mean it in the sense of impoverished or with lack of money. I saw them as rich, even lucky, to be so full of love despite living lives which most Americans would find unacceptable. 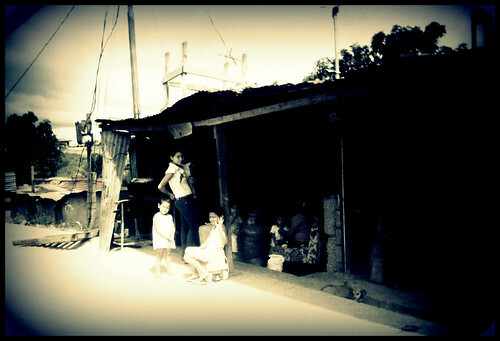 Now I am not trying to paint a pretty picture of what is still (essentially) a slum rife with problems. However, the citizens of La Carpio have heart. They work hard. They do not give up even under the most dire of circumstances, and they show respect and gratitude in ways I have never experienced before. They watch each other’s backs. On many occasions I witnessed older boys take the younger ones under their wings, blood brothers or not, to make sure that the little ones did not get lost in the shuffle. The older boys helped the younger get shoes, toys, and even pose for photos. It was amazing to see. They lean on each other. They know that despite volunteer groups coming in to help them build and grow, that all they have is each other. And Gail Nystrom, of course. She is the humble, brazen unspoken hero of La Carpio. She is another blog post or ten entirely and I will be telling you more about this amazing woman soon. Flash back to Miami. I lost my breath at the toy store and began to feel the tears well up. I shoved my way out of the store and through the thickening crowd in a panicked haze. I grabbed Trenton and told him that we had to leave. Now. What causes these overwhelming moments? It’s not my first time witnessing poverty. I lived it at one point. It’s the fear of losing that feeling. It’s the fear of forgetting of how those hugs made you feel, of not being able to fully explain it to your friends when you get home, or of losing the motivation to give as you must return to your day-to-day. It’s the fear of forgetting how much you want to help. 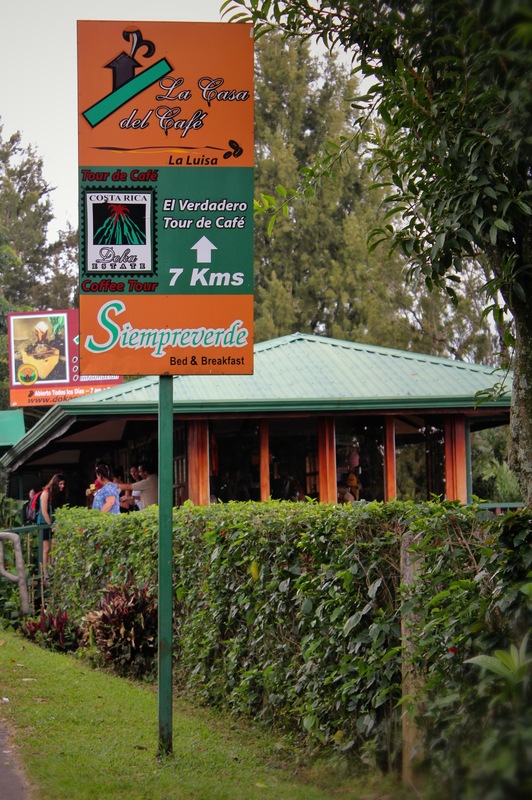 For that week in Costa Rica, a bus full of strangers stood still in their lives. Together they made something big happen, and in return they brought home bigger things in their hearts than they could have ever imagined. Creepy human tricks are a universal language. Loved this sweet jokester who entertained me while I fit him for shoes. Processing thoughts in a lucid manner will be a challenge for me, although it gets easier daily. My favorite photos thus far are on my Flickr account, so please enjoy as I wade through all of the data and check back often for updates. As I walked swiftly through customs I screeched to a halt when I saw the sign: Exit to Miami. I clutched my carry-on as if it was a security blanket. Maybe if I chose to not walk out that door, I could stay in Costa Rica for as long as I pleased? Maybe?? I wasn’t ready. I never expected to feel this way. I fell in love with La Carpio. The experiences I had in Costa Rica are simply way beyond spewing words and posting photos, but I promise to give it my best shot. Right now please enjoy a few of my favorites from a vast collection of photos. This little girl was very special and I was so happy to be able to fit her with (let’s face it), the coolest pair of Chuck Taylors that an eight-year-old of any background would covet. I called her Princesa Mariposa. She is humble and a kind soul. She is a solid representation of the kindness, hope, and beauty radiating from La Carpio’s upcoming generation. Much more to follow. Much more. Make two wishes every night; one for you and one for someone else. Tonight I wish for a peaceful sleep, and for Katie Lentile to take just ten tiny minutes to reflect on what she has done for the volunteers.